Proficiency Grading: The last rubrics you’ll ever need | Magister P.
OK, so maybe you’re not ready for a complete grading overhaul, or it might be that you are, but someone else isn’t. In this new post, I offer an example of how to use Proficiency goal rubrics independently within a traditional department-defined system using common grading categories. A simple process would be to keep the categories your department has, and use the Proficiency goal rubrics to grade work. A more complete process requires renaming grading categories for the sake of consistency, and communicating CI principles, but otherwise keeping the weights intact. I describe the more complete process in this post. For all Proficiency goal rubrics, click here. Next, let’s look at adjusting weights of traditional grading categories since it’s common for departments to have many (e.g. Homework, Quizzes, Classwork, Participation, Tests, etc.). The idea behind many categories is that students will have “multiple opportunities to prove mastery,” which is awesome, but no one says that you need multiple grading categories in order to provide those opporunities. That is, it’s completely possible to have various assessments used as evidence for this thing we are calling “Proficiency.” Thus, we want Proficiency to be worth as much as possible. Take the highest two categories (probably Quizzes, and Tests), rename them as “Listening & Reading Proficiency,” and “Writing & Speaking Proficiency.” I don’t recommend creating four categories (i.e. listening, reading, speaking, writing), because that really holds you to very specific assessments. Also, in anticipation of criticism concerning the “output” found in a productive category, note that having a certain grading category doesn’t mean we need a ton of grades in there, or to spend much class time at all assessing these. Just a few Timed Writes over the entire quarter ought to do it (Writing), and older students could do some retells (Speaking), but don’t have to. Proficiency is graded the same way as in my full grading system; just create a SINGLE assignment in the gradebook and update scores over the course of a grading period (as opposed to having multiple assignments that average with each other in the category). So, with this simple split of Proficiency into the more important receptive skills and less important productive skills, we now have 50% of the grade counting towards Proficiency. Update 11.9.15 A common question I’m asked is what to DO once this is all set up. It’s really quite simple; collect assignments and assessments, put them into a physical folder (and add scores to that 3rd 0% weight Portfolio category), and when you see something that’s a solid example of improved Proficiency, update the student’s grade. Right now, between Proficiency, and DEA, we have 75% of the grade accounted for, and there appears to be three categories (since we split Proficiency) instead of just two. Still, chances are you’ll be required to assess other stuff, and chances are that that stuff is of low importance. Common names for these are “Homework,” “Classwork,” or much broadly, “Graded Assignments.” I put all of that stuff into a grading category called “Knowledge,” a solution to whatever is out of one’s control (e.g. forced to use textbook workbooks, give isolated word vocabulary quizzes, or unit tests on cultural facts and grammatical identification/manipulation, etc.). Let’s pause for a minute to recognize that the rationale for calling this “knowledge” should be self-evident. Knowledge of how a language system works holds little value if one cannot understand the language, and knowledge of cultural facts is nice to know, but easily could be learning in social studies, not a language course. Knowledge isn’t even wisdom. Gaining knowledge is really just about memorizing things, which is the lowest thinking level on the original Bloom’s, revised Bloom’s, and even the new Bloom’s for languages from Bryce Hedstrom (nicely aligned with CI). You will be hard pressed to find an administrator, and/or colleagues who want you to emphasize lower-order thinking skills, so this should be an easy sell. Most of the work in this “Knowledge” category is independent from acquiring language in class, since it’s mostly memorization, and often in one’s native language. Here, “Knowledge” is 15%, and those knowledge tests are 10%. If you think this won’t work because Test categories tend to be given more weight since they’re considered summative assessments, remind people that a summative assessment doesn’t have to be a particular format, rather, it’s how the assessment is used. Proficiency, at 50% of the grade, is constantly updated, but considered a summative assessment by reporting where the student is at the end of a grading period. There doesn’t have to be a special assessment just to arrive at a summative evaluation. Lastly, in my grading system, there is a category called “Assignments” with 0% weight. It is a container that includes everything you could find in “Knowledge” above (considered “nice to know,” not “need to know”), as well as any assessments used to determine a Proficiency grade. My grading system is great when you have complete autonomy, or if everyone in the department comes to agree that proficiency is paramount, but the whole reason for this new post is that sometimes we’re met with resistance, and this “Proficiency” thing is a hard sell. One way to sell the idea of allotting 50% of a grade to Proficiency is considering the course “Portfolio-Based.” For some reason, this seems to make sense to people who think the idea is loose and too holistic. Your Portfolio will contain evidence, updated often, and the evidence is evaluated by the Proficiency goal criteria. 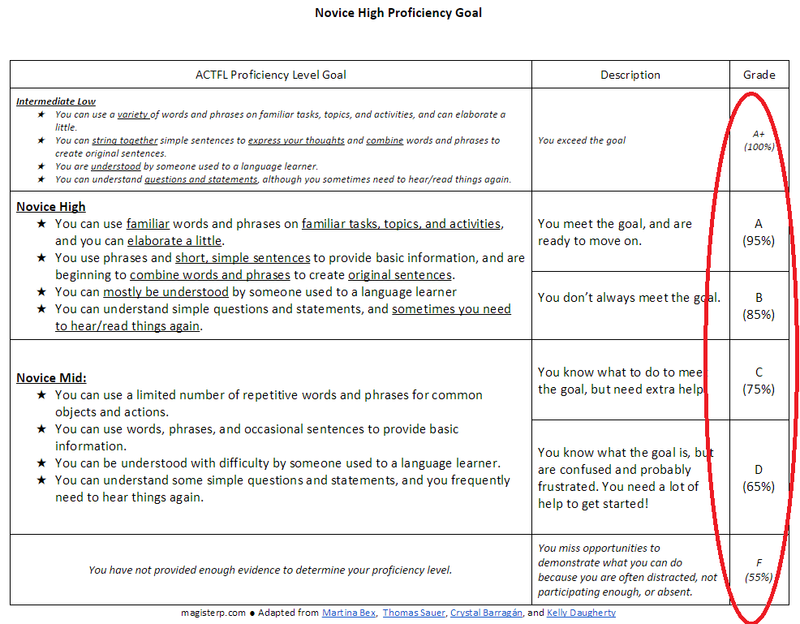 – Use the Proficiency goal rubrics to grade most work. – Allot most of the weight to Proficiency (splitting into two categories if need be). – Include DEA, or equivalent. – Create a category for all the “stuff” you value least, but are required to assess. Lance, this is one of the most helpful things I’ve read in eight years of teaching; further, I appreciate how well written and clear it is. 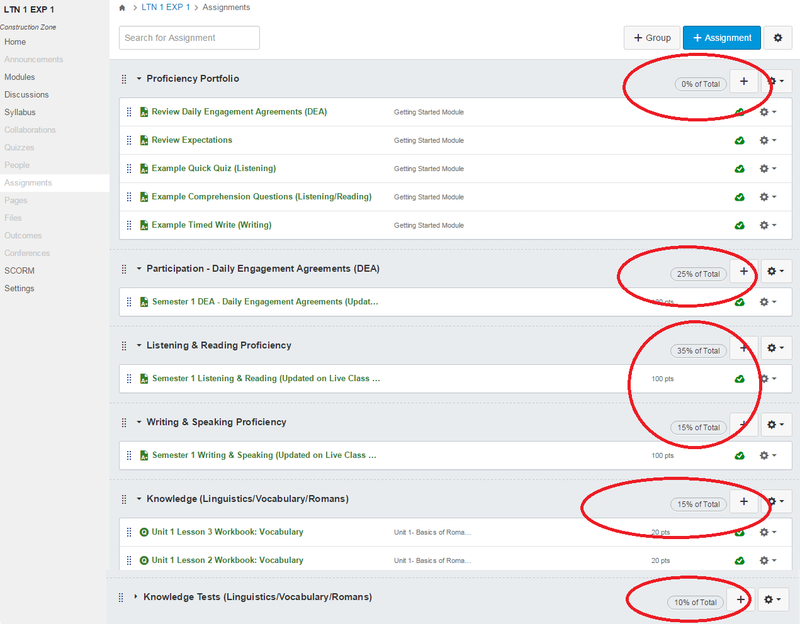 Thank you for talking about turning proficiency grading into more traditional grading methods – I have wanted to grade on proficiency or standards, but I didn’t know how to put this into my gradebook…now I do! Pingback: A New Grading System: The last one you’ll ever need (once you’re ready) | Magister P.
The premise you’ve established here is great and I love the idea of grading mostly on proficiency (I grade nearly 100% on proficiency). There are only two parts that I have some issues with. The first is that productive skills are less important than receptive skills. I can see where this comes from, but I think the basic idea is flawed. Yes, it is 100% true that productive skills are a result of receptive skills, but if enough input is there, then the output will be there as well. There’s no need to assess either frequently if you’re constantly doing informal assessments during class. However, if a student is really good at the receptive skills and that section outweighs the productive skills, the overall result will be an inaccurate measurement of the student’s ability to DO the language. For example, lets say a student is really good at the receptive skills but is lacking in the productive skills. They cannot be very successful using language in real situations like being in the country even for a vacation. They may be able to understand what is being told to them, but if they can’t respond back and have meaningful interaction, they have ultimately failed and will feel frustrated. So although I agree that productive skills shouldn’t be measured often, they should be measured and should weigh more than receptive skills. If a student can do the productive skills, it is inherent that they can do the receptive skills as they are built in and build up to the productive skills. But just because a student can do the receptive skills, does not mean they can produce anything. The second issue I have is with grouping the two receptive and two productive skills together. I understand why you do it, but if I want to know where one of my students stands on any particular skill, the waters are muddied because I can tell they’re good at receptive skills, but I cannot tell if they are better at one or the other or both are equally good. By dividing them out into the four skills, you can gain a better idea where a student is and then provide the correct input to bridge the gap. For example, if I notice a student is having issues with writing, I know they need more reading input. If a student is having issues with speaking, I know they need more listening input. If they are lacking in listening, they need to hear more language. If they are grouped together, I don’t know if the student needs to read more or listen to more language without going back to the gradebook and looking at the individual assessments. This can be alleviated by keeping the skills separated from the start. Overall, I like the ideas presented here. Thank you! This is not my ideal system. In this post, the weights are an example of what to do in an established system so you can really just get one with using the rubrics. The idea behind all of my grading is that students who take longer to “DO the language,” as you put it, aren’t penalized. You are correct about receptive skills not ensuring productive ones (although the latter is a result, like you mention), but I don’t need my students to produce anything within a certain amount of time, if ever. Yes, I am pulling the Classical Language Card right now, but I don’t know a single CI teacher who doesn’t EVENTUALLY (key word here) get students speaking and writing. I think you are more inclined to say that we have more control over acquisition than I am. You are quite adept at analyzing student work and reacting accordingly. At least for the state of Latin right now, I cannot provide any more additional aural input than I am, and reading is of course the focus. That said, adjustments to input are extremely limited. Separating the skills might inform you, but having a grade for each skill is not going to improve acquisition for my students whatsoever. Also, I forgot to mention that all work recorded in some kind of 0 weight “Portfolio” can be used to identify trends, such as the ones you react to in terms of adjusting input. All of this can be done independently from assigning a grade for the class. Taking a language class with me is not about doing equally well in all 4 skills. ACTFL states that the skills improve at different rates (just like how all learners learn). I suppose the main difference between us is that you think we can do more about that than I think we can. Man, you have been doing some reading tonight. Keep it coming, these are great discussions! I do agree that each student will acquire things at different rates and that not all four skills develop equally over time. The proficiency-based approach fits with this. Pingback: Grade [Spin]Doctors: Playing by our School’s Rules | Magister P.
Pingback: Proficiency Grading FAQs, and New Rubric Option | Magister P.
Pingback: CI Program Checklist: 12 of 13 | Magister P.
Pingback: Reporting Scores vs. Grading | Magister P.
Pingback: Grading & Reporting Schemes | Magister P.
Pingback: NTPRS 2017 Resources | Magister P.